The Belko Experiment Review | Nerd Much? When it comes to the horror genre truly original idea seem to be a dying breed, as scripts recycle the same concepts and ideas over and over again. This is due to not only the popularity of certain genres within a given era or even season, but how difficult it can be to truly surprise audiences. The Belko Experiment sadly falls into this trap as the general theme and story for this horror/comedy isn’t terribly unique. 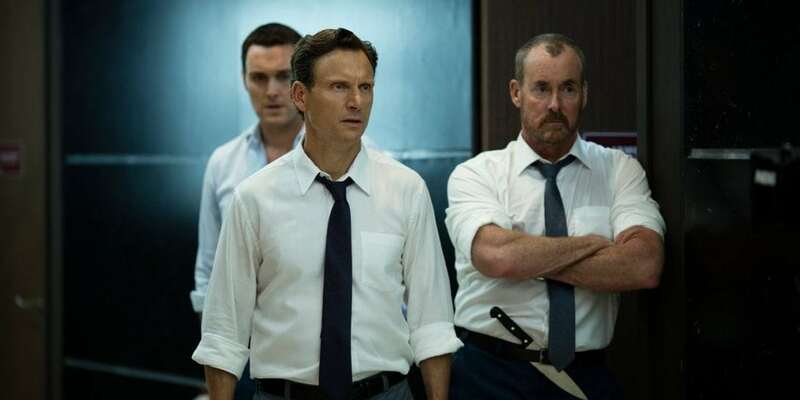 Yet despite this issue, The Belko Experiment is still an entertaining, bloody movie that isn’t afraid to poke fun at itself from time to time. Set in Bogota, Columbia, The Belko Experiment follows Mike Milch (John Gallagher Jr.) and several other employees that work in a rather remote facility for a non-profit organization called Belko. Upon arriving, the 80 or so employees are quickly introduced and then subsequently trapped inside of the seven-story office building via a high-tech security system. A voice over the loudspeakers then instructs the employees that in order to survive they need to kill a specific number of their co-workers or they’ll detonate the bombs implanted in their necks. People then bargain, yell, and ultimately fight for survival as friends turn on friends for the sake of seeing another day. We’ve seen this story again and again in movies like The Purge and Battle Royale, but where those films expanded beyond the idea of human nature The Belko Experiment fails to impress. Despite the corporate setting, the movie never delves into possible topics like downsizing or how big businesses view their workers. It’s a shame because there’s a lot of potential for a thoughtful discussion to be had, but director Greg McLean never goes beyond “violence is human nature.” While this is true, it’s not especially interesting given the survival genre has been conveying the same message for years now. However, it’s serviceable enough to allow viewers to enjoy the moment to moment violence scattered throughout. The same goes for all the characters, with the exception of one, who are fairly one dimensional and have fairly predictable character arcs. The big boss Barry Norris (Tony Goldwyn) and obsessive worker Wendell Dukes (John C. McGinley) are so obviously going to be the villains it robs any scene of tension because you already know where they will end up. Some other co-workers like Milch’s girlfriend Leandra (Adria Arjona) fair better in the story department as she makes up much of the moral backbone to the events transpiring and Milch’s transformation is engaging enough to watch for the 90-minute runtime. Despite the characters themselves being predictable, all the actors/actresses lean into their roles with such earnestness that you cannot help but enjoy them. Gallagher Jr delivers a fine performance, but it’s the various supporting cast members that make The Belko Experiment so entertaining. Goldwyn is deliciously evil and McGinley is clearly having way too much fun in the role as the duo have fantastic chemistry together. Other actors like Sean Gunn, Josh Brener, and David Del Rio provide some good laughs, while the new girl played by Melonie Diaz is a nice subversion on audience expectations. However, there’s little doubt that what people will be talking about is the insane, gory violence that punctuates pretty much every moment of the film. It’s pretty clear early on that McLean plans on displaying as much of the brutality on screen as he can get away with, which is fantastic given most survival horror-esc films shy away from showing the gritty details. Enhancing this are the practical effects that allows the camera to show the chaos without cutting away too much, making for many gut-wrenching moments. Make no mistake this is a very violent movie, but where The Belko Experiment surprises is that the blood and gore isn’t just used for comedic effect. Sure, there are some pretty well-timed gags involving exploding heads, but a large portion of the combat is kept in a rather serious tone. This, however, does cause some issues with the film’s overall tone as it never truly strikes the right balance between horror and comedy. There are some great moments from both genres, but it never truly clicks together in a cohesive way that allows both elements to shine. Midway through The Belko Experiment it’s clear that humor has taken a backseat (despite having what is the single most dramatic shot of a tape dispenser in movie history) so McLean can show more action sequences. It’s a shame this is the case because the cast is so clearly game for anything thrown at them, one has to wonder why The Belko Experiment is so determined to take itself seriously halfway in. Yet, none of this means that The Belko Experiment was a bad movie, but just one that failed to live up to its full potential. There are a lot of really interesting ideas on display, just none of them truly come to surface in a meaningful or unique way. If you are going into The Belko Experiment hoping for something different you might want to look somewhere else, however, if campy violence is your thing then give this film a watch. There is some truly wonderful lighting on display later on and most of the action scenes are highly enjoyable. While this movie certainly won’t win any awards it’s an entertaining enough ride to keep you engaged for its modest 90-minute runtime.